Sound reinforcement for your event. 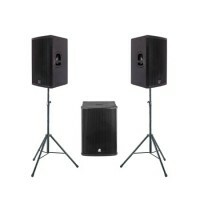 Consists of:2 x Electro Voice ZXA1 (800W)2 x K&M Speaker standsCables.. Consists of:2 x Electro-Voice SXA100+(200W)2 x K&M speaker standsCables..
Technical SpecificationMax SPL129 dBAmp ClassClass-DPeak Power 1200 WPRG Power 800 WRMS power 600 WC..
Technical SpecificationMax SPL130 dBAmp ClassClass-DPeak Power 1200 WPRG Power 800 WRMS power 600 WC..
Technical SpecificationMax SPL128 dBAmp TechnologyDigipro® G2Amp ClassClass-DPeak Power1600 WPRG Pow.. Consists of:2 x Electro voice ZXA1(800W)2 x Electro voice ZXA1 SUB(700W)2 x Distance polesCables.. Consists of:2 x dB Opera 12 (1.2 kw) - 128 dB1 x dB Sub 15H (1 kw) - 134 dB2 x K&M speaker stand.. Consists of:2 x dB Opera 12 (1.2 kw) - 128 dB2 x dB Sub 15H (1 kw) - 134 dB2 x K&MDistance poles..
Technical specificationdB LVX 15:Max SPL128 dBAmp TechnologyDigipro® G2Amp ClassClass-DPeak Power160..
Technical specification:dB Technologies LVX 15Peak Power1600 WPRG Power800 WMax SPL128 dBTechnologie.. Consists of:2 x dB Technologies LVX 15 2 x dB Technologies SUB 15H2 x dB Technologies SUB 18H&n..